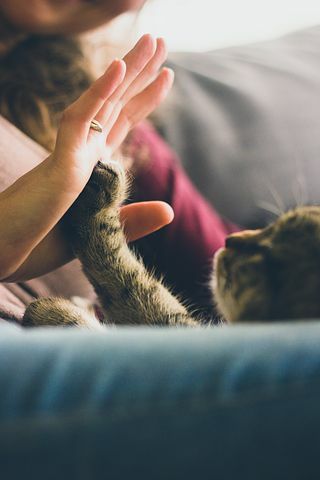 While cats confined to an indoor environment generally live longer and are at less risk for contracting infectious diseases or injuries due to trauma, they are at greater risk for a variety of behavioral problems. These problems include urinating and defecating outside the litter box, anxiety, eating disorders, attention seeking, aggression, self-injury and compulsive disorders like excessive grooming and scratching. Providing an enriched environment can increase activity, decrease mental stagnation and prevent many of these issues. 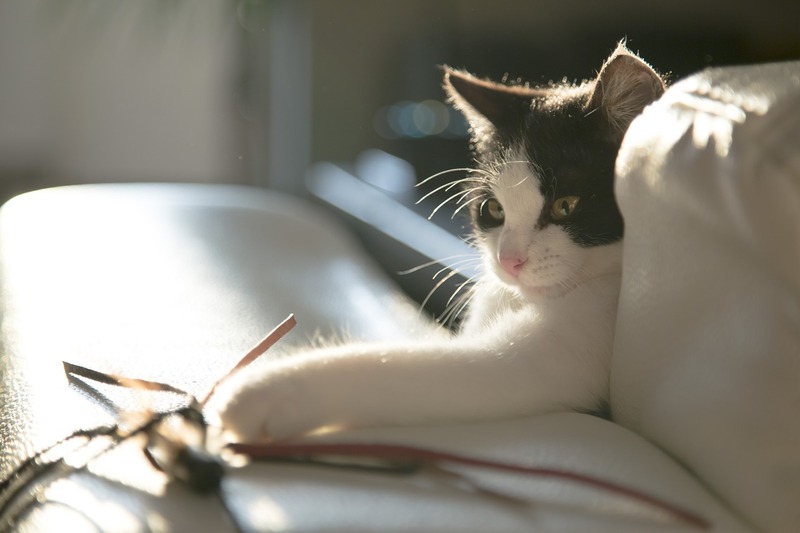 All cats need mental stimulation, but this is especially important for indoor cats. 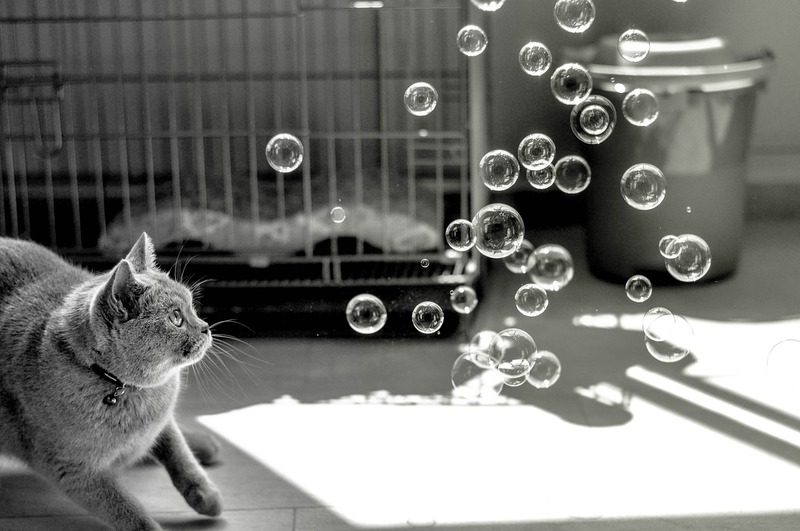 An enriched environment will give cats the opportunity to create their own positive experiences in an enclosed space. The goal is to “create an environment of plenty” for your cat. That means plenty of room, litter boxes, food, water and things to do. Use food puzzles, interactive toys or food balls. You can purchase these items at any pet supply store or make them yourself. To create homemade puzzles from a cardboard box or a plastic bottle, simply cut small holes into the object and fill it with your cat’s favorite food or treats. You can also hide food in different places around the house so your cat can “hunt” for his/her food. Place the food in corners, on shelves or behind furniture. If possible, divide meals into three or four small servings and alternate hiding them, or you can try placing a treat in a new area each day. Start by hiding the treat in the same spot each day. After a few days of this, try to hide the treat near the original location but not exactly in the same place. Once the cat has gotten used to “hunting” for the treat, you can move on to more remote areas. This should be done daily so your cat gets used to the routine of searching and reward. If days go by with no reward, your cat will stop looking. Boxes, bags and carriers that are left out provide nice hiding places for cats. Cats like to be up high. 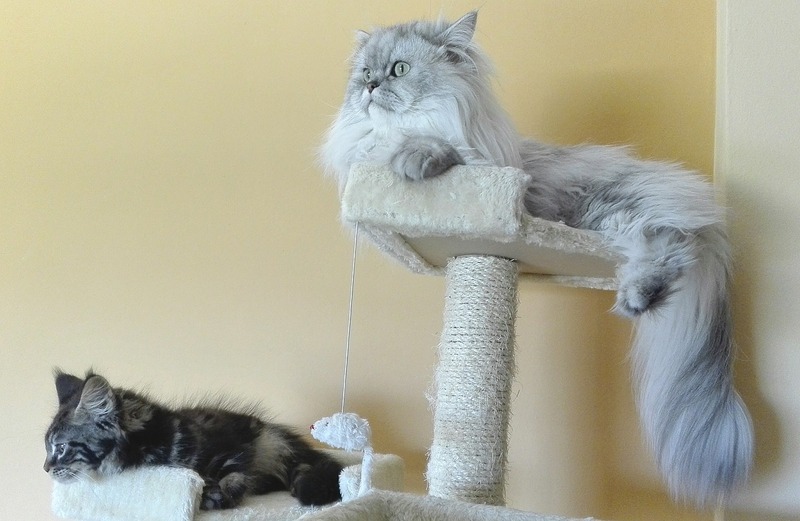 Providing access to elevated places makes cats happy and increases the overall space available to them. Provide your cat with a carpeted tree or condo, preferably with hiding spots, cat perches and shelves. Single perches with room for only one cat at a time are a good way to help your cat escape from any other household animals. Access to windows, preferably with perches, provides mental stimulation as your cat looks out the window. Regularly move beds and perches. This mimics a changing outdoor environment and encourages cats to explore. Keep in mind that your cat may have become sedentary and need encouragement to climb. Try feeding treats or a portion of his/her meal on the kitty tree to get your cat used to this behavior. Scratching comes naturally to your cat. Make sure to provide acceptable scratching materials for your cat, such as a carpeted post or cardboard plank. To train your cat to use these items, reward with treats and praise each time he/she scratches appropriately. You can also place catnip, treats and toys on or near the post to encourage this behavior. Scratching posts should be sturdy and made of materials cats prefer (like wood, sisal rope, rough fabric or cardboard). Put the scratching post next to a window, sleeping area or any other place your cat favors. Many cats prefer vertical scratching posts, but some prefer horizontal ones. If your cat does not seem interested in one type of post or material, try another until you find the right fit. Make the litter box attractive. Some cats are big and need a large box. A large plastic storage box (used to store items under the bed) may make a better litter box if your cat barely fits in the litter box that you have. Most cats (though not all) prefer unscented, clumping litter. You can experiment by offering a choice of litters in side by side boxes for a week to see which your cat prefers. Think of a hooded litter box like a Porta-Potty. That is how many kitties seem to think of them when they choose not to use them. Litter boxes should be kept clean. That means scooping twice a day, cleaning and changing litter weekly and buying a whole new box yearly. If you are using a hooded box, do not forget to clean the underside of the hood. Location, location, location. If your cat is choosing not to use the litter box consistently, there may be too much noise or activity where the box is located. Many owners use the laundry room. If a noise from the washer or dryer frightens your cat while he/she is doing business, he/she will be fearful about using the litter box in there. A box should temporarily be put in the location the cat is choosing to go. 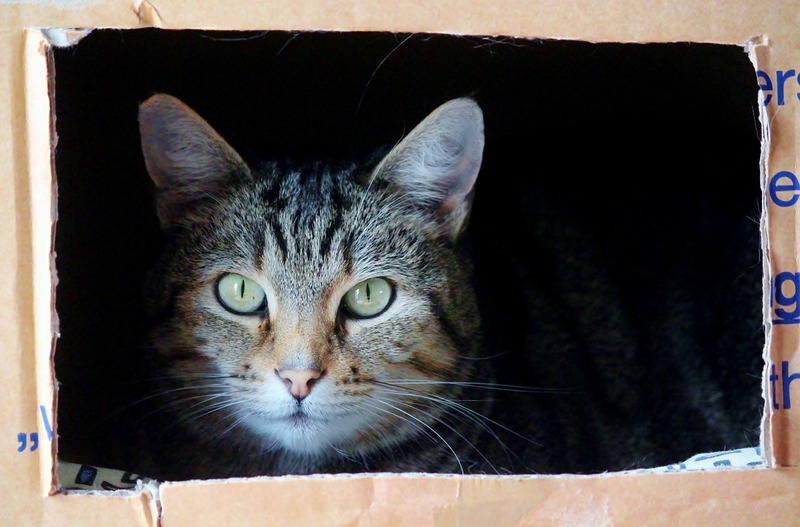 When the cat is back in the box consistently, it can be moved a small distance at a time to a more convenient location for the household. Remember, there should always be at least one litter box per cat in the house. These litter boxes should be in different locations. If your cat is not using the litter box consistently, there should be an extra box available as well (one per cat, plus one). Most of us do not look at our cats and think they are stressed. If your cat is not urinating where he/she should be or has other behavioral issues without an identifiable medical cause, then chances are he/she is being stressed by something. Many cats just like routine. Feeding them and playing with them at the same time every day may be all they need. If the stressor can be identified quickly, the prognosis for changing the behavior is great. As time goes on and habits are formed, behaviors become increasingly difficult to change, but do not give up. Prevention and management of many common behavior problems in indoor cats requires identifying and changing (if possible) the stressors in their environment, providing ways to stimulate indoor exploration and providing opportunities for mental, physical and social stimulation. If the underlying stressor cannot be identified or it is something that cannot be changed (e.g., children or another pet), Feliway may help. This is a feline pheromone that has a calming effect on cats and helps decrease aggression and inappropriate elimination behaviors. There is mounting evidence of its benefits in other areas of feline behavioral problems as well. Several other suggestions about how to identify and deal with underlying stressors that cause behavioral and physical problems in cats can be found at The Ohio State College of Veterinary School’s website for indoor cats.